Submitted by Ed (not verified) on June 8, 2006 - 6:50am. I agree that Gillette's Mach3 is the closest thing to being a revolutionary advancement for shaving. It's only downfall is the difficulty in trimming sideburns. The Fusion, which fixed the sideburn problem, is better if you don't have anymore than everyday stubble, but the Mach3 really cuts through my ritual of not shaving Friday, Saturday and Sunday. I find that I break out if I don't give my face a rest for a few days. As to the shaving cream, I've tried most of the items mentioned, and some good old fashioned ones too. 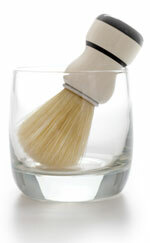 My favorites: Burt's Bees shaving soap - Good old-fashioned mug and brush with a round of soap to lather up. It's scented like Bay Rum, so while it's a classic, it's not your typical stuffy old-man variety scent. One stellar find in the area of cream/lubricants is "Shave Secret" (www.shavesecret.com). It is in a small eye-dropper type bottle, and the directions call for using 3-5 drops on a wet face just before shaving. I've used it for about a year now, alternating with the Burts Bees soap, and all I can say without reserve is that it is the ABSOLUTELY smoothest shave I've ever had - no foam, no soap, no brush, nothing but the drops you rub on your face and your razor, and it works like a charm. Again, it leaves you smelling spicy like Bay Rum. Plus, it acts as a great moisturizer for dry skin. Plus, in a pinch it can tame really unruly hair. Plus, the cost is extremely reasonable. A bottle costs about $4, it can be found at WalMart, and it last for about 4-8 months.